Last weekend, The Hubby and I visited California's Sequoia National Park, on the western side of the Sierra Nevada. The park contains the "Giant Forest," home to 5 of the 10 biggest trees on Earth. These trees are big. Big, big, big! 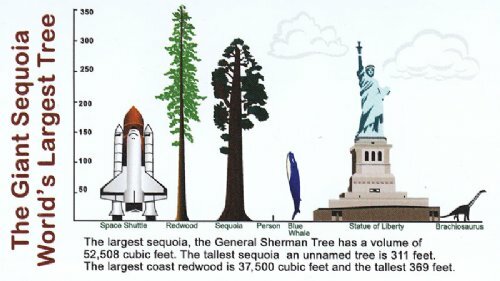 That teeny little scratch between the Sequoia and the Blue Whale? That's the size of a person. There's just no way of describing how big this thing is. You just have to see it in real life. You'll never forget it. Putting your feet up and having a drink at the end of the day with friends? Priceless!